Despite the facts of our weather this summer, it seems like summer has been very short. Trying to squash lots of fun into the few days remaining. Went to the zoo yesterday with the 5 year old twin boys I have mentioned here before. Made the mistake of buying them each a glass of orange pop early in the adventure! Acted like hi-test gasoline in those little engines. We did the zoo at a very fast clip. The weather was perfect for the day-so many families and school groups were there enjoying it as well. Lots-o-fun! Picked up a new quilt magazine the other day at Wegmans. It’s called Generation Q. I’ve followed their blog for a while now. (The Q is for quilting.) It says on the cover that it’s the premiere issue-no subscriptions yet. I often start reading a quilt magazine with the letters from readers and this was no different. Wonder where they got the readers if this is the premiere? Anyway guess who wrote the very first letter to the editor?….. My co-blogger, Marija. Maybe she’ll be able to tell us how she got her early issue that she shows in her photo. Hey, Amherst quilters are everywhere. We’re in the count down to our annual seminar. Have you signed up for your class(es) yet? Join us for lots of quilty fun. I was surprised to find that title phrase at the top of one of the blogs I periodically visit. When I sounded it out, I thought “is that Chautauqua?” and I was right. All of us around here know about the fall Chautauqua quilting weekend. Mary Fons, daughter of quilting rock star Marianne Fons, who is taking up the reins that Liz Porter put down for retirement will be at Chautauqua with her mom this fall. See her post about it here. Many of you have tasted and loved Linda Hunter’s easy butterscotch cake. She sent her recipe to me to share with all of you.Click here Butterscotch Cake Recipe for the recipe. Are you into English paper piecing? Love those Grandmother’s flower garden quilts made with gazillions of hexagons? You might be interested in this new book Hexa-go-go and the blog tour about it. Click here to see what it’s all about. Babysitting a five year old all day today-wish me luck. I know I’ll sleep well tonight! Are you like me, buying lots of “one-use” gadgets for your sewing? If so, you probably have at least one of those Clover brand yo-yo makers in your sewing room somewhere. Maybe it’s a basic circle, for the traditional yo-yo shape. Or perhaps you went for one of the unusual ones-the heart, or the pentagonal flower, or the butterfly. Here’s a clever use of those tools, from the designers at Nancy’s Notions. Nancy demonstrates in this video how to use those yo-yo tools for a smocked effect. This really got my creative juices flowing. What can I do with this idea? The holidays are on the horizon-this effect makes a simple technique look quite glamorous. I love those kinds of things, don’t you? Sometimes it’s so easy to fool the recipient of your gift into thinking it took hours to make it, and quite a bit of skill. I’ll never tell–we’ll make it our secret! She mentions her freebies in the interview. Here’s a link to her freebie section; lots of goodies there for fans. I’m pretty sure I’ll be making her free ornament for some folks this Christmas. Anyway…how is everyone’s summer? Are you thinking holidays yet? Making gifts already? 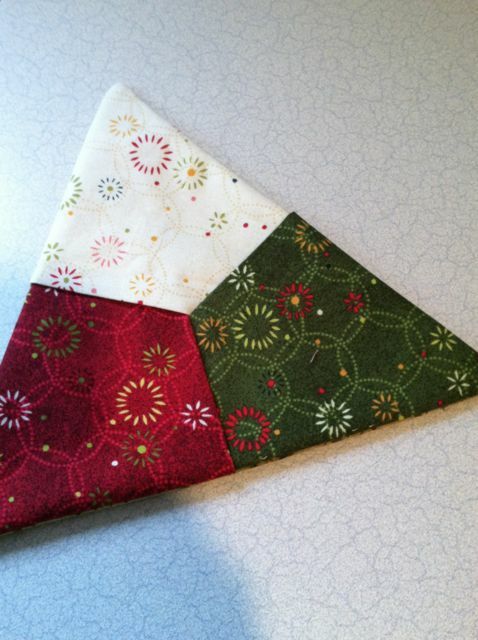 I just love, love love Mary Ellen’s instructions for those triangular coasters! (previous post) Those are promptly added to my favorite list of small gifts to make – thanks ME! As we start to rev-up our sewing, quilting and holiday gift making, some new tools might be of help…I just saw this blog post from Moda (fabric manufacturer) and …hmmm, not sure what to think about these QUILT STICKS! What do you think? Another inspiration came from the recent email that came from our Newsletter fairy, Colleen, about Karen Goddard’s quilt being featured on Laura’s Artfabrick blog (congrats Karen!!) – small, fused, fun quilts! Those can be amazing for gifts, for ourselves, to play and explore creatively…Note-to-self: do more of that!! 🙂 So, if you are thinking the same, check out this great tip from another “fusing diva”, Freida Anderson – it is a video and the idea of layering with paper is really cool!! Speaking of creativity – do you take pictures? Pictures of things that make you smile, that are beautiful, that are inspiration for a future quilt? I do. A LOT. So, even if you are not crazy about them as I am and take just some photos sometimes – why not show them? And not just show them – why not show them at world-famous, ever-fabulous International Quilt Festival in Houston!! No…I did not loose my mind, honest! Yes….you CAN do it, really! To prove it to you – I did it in 2010! Yes I had one of my photos exhibited in IQF in Houston – and SO CAN YOU!!! What in the world am I talking about? Well, in 2010 organizers and directors of IQF took the fact that quilters DO take a lot of photos, usually LOVE and are inspired by them, etc., etc., to be their next addition to the fabulous Houston Festival – hence the Eye of the Quilter exibit was born! I found about it through one of my internet quilting groups (yes, I do belong to a few…) and decided to give it a try – I got selected! I have a lovely card and a pair of admission tickets to prove it – of course I couldn’t go, but I do have a photo of my exhibit piece (somewhere…) that a fellow quilter sent me, maybe I should frame that? LOL!! Now let’s get back to reality and my a bit ridiculous title of this post. Yeah, I knew this was coming….I did promise to explain, didn’t I? Well, nothing really new here – I did start to finalize my post yesterday during lunch break…but then things happen in the lab, specially during summers, when young interns are here…let’s not go there, but enough to say that I was needed, my sandwich was not even finished, much less the blog post! HA, HA! Then I came home, went straight to my quilt class (and that part of the day was just fabulous, but more about that (and some photos!) in the next post), had a very honest intention to finish the post after the class but then there is Olympics….and it was volleyball! How amazing was to watch Misty and Kerry win their third gold!? I was trying to remember, unsuccessfully, a silly knock-knock joke from my childhood that had a punch line that began with “orange you glad I didn’t say…”. That’s all I can remember. If you know this joke, please send it to me to put me out of my misery! Anyway, got an e-mail today from Quilting Arts about color choices. It seems “Tangerine Tango” is the 2012 color of the year from Pantone. Have we seen shades of orange everywhere this year? Not me, although I’ve stayed out of the stores more than usual. Thinking about the new quilt fabrics I’ve fondled so far this year, I do recall lots of orange. I’ve even purchased some yardage of a fabric with paisley in shades of orange and turquoise. So hot and summery looking. Here’s a link to a blog post from Quilting Arts about orange in quilts. I don’t use much orange in my quilts. I don’t think I consciously avoid it, but I don’t get drawn to it either. At quilt shows I am always surprised at the lovely quilts using lots of orange, and have commented to myself and friends that I should try out some orange. How about you? Orange you glad I made you think about a new color for your quilts? Wow, I went out to walk the dog this morning at about 7:15. I always check my kitchen weather station just before we leave so I know if I will need a jacket or not. It’s a habit, so even during the summer I check. It was 83 degrees at 7:15! This is not my idea of a great summer day, fans. I want it cooler in the evenings and early mornings. It was very gray and windy while we walked, so the old-fashioned method of forecasting tells me rain is coming-but I think it might be a heck of a storm instead of a steady soaker like we need. -not a great shot, but you’ll be able to see what the coaster looks like. I had a request to post my visual for constructing this here at the blog. You might find this to be an easy gift idea for this holiday season. I’d be glad to show you at a guild meeting if the visual isn’t clear. Click 60 degree coasters for the directions. What you need to know, in addition to what is on the directions, is that you need to cut 4 triangles for each coaster or mat. They need to be equilateral triangles (60 degree) of any length sides, just make sure all 4 are the same size. Keep one of them flat, fold the other 3 in half with wrong sides together and press a nice sharp crease. I just use the outline of the 8 1/2″ triangle ruler, and the resulting mat is a good size for most coffee mugs or iced tea glasses. Once you have layered the pieces as shown in the included link, stitch all the way around the perimeter with a 1/4″ seam (no opening needed for turning), clip the corners a bit, and turn them right side out through the center opening. Fix up the corners with your favorite tool–chopstick, knitting needle, whatever. Then give your coaster a nice steam press. Larger ones will make nice mats for under cookie plates, etc.